The tomatillos. Boil the fresh tomatillos and chiles in salted water to cover until tender, 10 to 15 minutes; drain. Simply drain canned tomatillos. The purre. Place the tomatillos and chiles (raw ones if using canned tomatillos) in a blender or food processor, along with the cilantro, onion and garlic; if using a blender, stir well. Process until smooth, but retaining a little texture. The sauce. Heat the vegetable oil in a medium-large skillet set over medium-high. 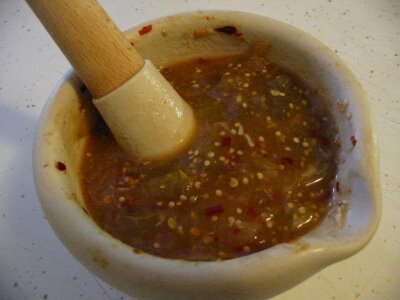 When hot enough to make a drop of the puree sizzle sharply, pour it in all at once and stir constantly for 4 or 5 minutes, until darker and thicker. Add the broth, let return to boil, reduce the heat to medium and simmer until thick enough to coat a spoon, about 10 minutes. Season with salt.